I think that Bilbo might have just saved me from going a bit crackers!! I now know that drawing up the cutting list is a part of the quilt design process which is pretty damn tricky, involving lots of concentration and calculations regarding extra ¼" seam allowances. Bilbo to the rescue, though, with her comment on my previous post saying, 'give us a shout if you need at hand at sorting out the cutting plan'. Good - thank you. I was doing quite well with regard to working out the piece sizes that I need to cut for the candle block in the middle of my runner, but then I realised that I have a couple of half square triangles in the design, and can I work out what the fabric sizes for these should be? If I was to tell you that the two HSTs in question are to be a finished size of 1½", can anyone tell me what size square of each of the two fabrics I should be cutting?? 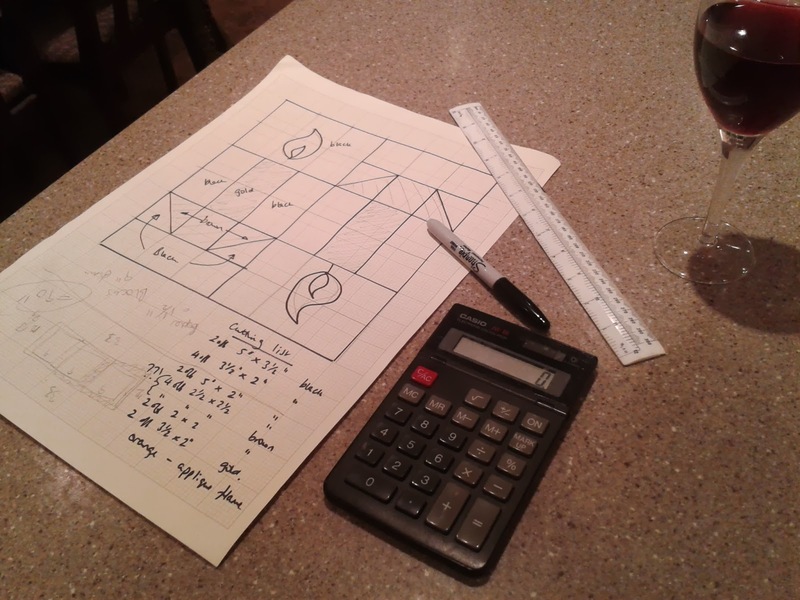 I should be able to work this out, but it's getting late, and - yes - that is a glass of red that you can see on the worktop. Back to the thinking in the morning! What a helpful site, Donna - thank you so much! I've printed the list out and stuck it underneath my cutting mat so I don't lose it! Thank you, Sharon - that's good advice. Officially it's 2 3/8" as Joanna said, I think, but I always go bigger like Sharon, partly cos it's easier to see the 2 1/2 or even 3" lines on the ruler, but also cos it gives you some wiggle room to allow for your seam wandering a bit, etc. I agree about cutting to eighth lines on the ruler - that's starting to get a bit fiddly, especially when you think about the width of the stitch line & the allowance for turning and pressing open. Don't know what you mean about seams wandering ...! haha! Yes, given my experiences last year (year before?) with the Incredible Shrinking Cream fabric which lost a bit every time I pressed a seam, I'm inclined to use slightly oversize pieces for the HSTs. There are only 4 to do for this block, so I'm not doing anything fancy like 2 or 4 at once or anything.